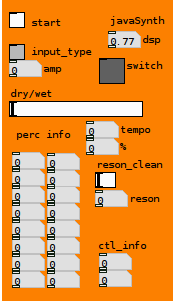 The Java Synthesizer is an offshoot from early versions of Bell Granular Synthesis. It is essentially a rhythm synthesizer that creates rhythmic textures based on input parameters. It consists of an eight-voice FM synthesizer (each timbrely independent) and eight-envelope generators. There is a mapping system that is then used to control the relationship of each synthesizer and each envelope. Now in its 5th version (second generation), the javaSynth has become more stable, the hardware interface has been solidified, the GUI is now in place and issues with synchronisation have been solved. Stay tuned for new music coming soon.